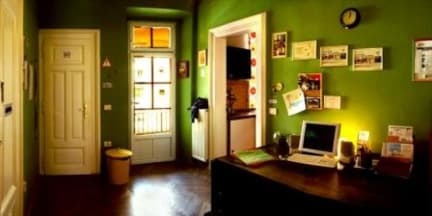 The Fluxus hostel is situated in the heart of the city centre. It is within a short walking distance (less than 5 min) from all the major tourist attractions, including the Parliament, department stores and numerous other shops, banks, the Cankarjev dom cultural and congress centre, the Opera house, several theatres, galleries, museums and bars. Nearby you will also find all kinds of restaurants (Slovene, Italian, Mexican, Greek, Thai, Indian, Serbian). We are located in the city centre, the area is safe and our rooms are quiet. Free towels & bed linen, coffee & tea, free internet & wifi and most important air conditioner to make you sleep well during hot summer nights. Tourist tax 3.13€ per night is not included in price. The reception is open until 8PM. All the guests will be provided with access codes that you can enter the hostel also during the night. If you plan to arrive late we will ask you to send us copy of ID that we don't need to wake you up in the morning to check you in. Great hostel, comfortable and with good atmosphere. Fluxus hostel has a great location. Reception doesn't work all the time, so sometimes there is no one to check you in and you have to find your bed by yourself.